The following procedures can be performed under each reconstructive category. Implant reconstruction with tissue expanders is a two-stage process. 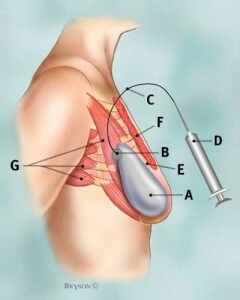 First, the tissue expanders are placed underneath the pectoralis muscle of the chest wall and expanded. Next, the tissue expander is removed and a permanent saline or silicone implant is inserted. A second method in this category is direct-to-implant reconstruction. In this option, the full sized implant is placed at the time of mastectomy – no tissue expansion is performed and the reconstruction is nearly complete on the same day as the mastectomy. There are many procedures in this category and all involve moving tissue from one part of the body to the reconstructed breast. Some methods include pedicled TRAM flaps (transverse rectus abdominus myocutaneous), free Muscle sparing TRAM flaps, free DIEP flaps (deep inferior epigastric perforator), free TUG flaps (transverse upper gracilis free flap) or free Gluteal flaps. Latissimus dorsi muscle Courtesy of breastcancer.orgThis procedure is performed using the latissimus dorsi muscle. The muscle is moved from the back to the breast defect in combination with either saline or silicone breast implants to reconstruct the breast. Women who are candidates for breast reconstruction should be offered the full spectrum of reconstructive options to achieve the best outcome. Reconstruction is a very personal decision. Patients will find that many plastic surgeons offer a limited list of options for reconstruction. Plastic surgeons at NCI-designated cancer centers, such as Fox Chase Cancer Center, typically offer the most options. I recommend finding a plastic surgeon that offers the full spectrum of reconstructive options and will discuss in detail the option that best fits you. He or she will help you choose an option that maximizes the cosmetic outcome for your desires, body shape, weight, cancer treatment, unilateral or bilateral mastectomy and personal habits, like smoking. My Doctor Told Me I Have A “Precancerous” Lesion. Do I Have Cancer? Is Single Port Surgery Right for Me? Guess who I ran into at BJ’s Wholesale Club in October?